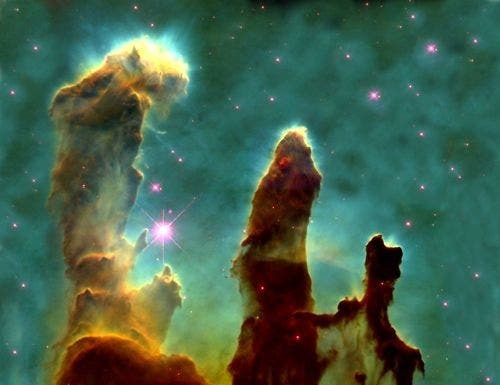 In early 2007, scientists using the Spitzer discovered evidence that potentially indicates the famed three Pillars of Creation photographed by NASA's Hubble Space Telescope in 1995 in the Eagle Nebula were destroyed by a nearby supernova explosion about 6,000 years ago, but the light showing the new shape of the nebula will not reach Earth for another thousand years. A striking image from Spitzer (below) shows the intact dust towers next to a giant cloud of hot dust thought to have been scorched by the blast of a star that exploded, or went supernova. Astronomers speculate that the supernova's shock wave could have already reached the dusty towers, causing them to topple about 6,000 years ago. However, because light from this region takes 7,000 years to reach Earth, we won't be able to capture photos of the destruction for another millenium or so. Spitzer's view of the region shows the entire Eagle nebula, a vast and stormy community of stars set amid clouds and steep pillars made of gas and dust, including the three well-known "Pillars of Creation." "I remember seeing a photograph of these pillars more than a decade ago and being inspired to become an astronomer," said Nicolas Flagey of The Institut d'Astrophysique Spatiale in France. "Now, we have discovered something new about this region we thought we understood so well." Astronomers have long predicted that a supernova blast wave would mean the end for the popular pillars. The region is littered with 20 or so stars ripe for exploding, so it was only a matter of time, they reasoned, before one would blow up. The new Spitzer observations suggest one of these stellar time bombs has in fact already detonated, an event humans most likely witnessed 1,000 to 2,000 years ago as an unusually bright star in the sky. Whenever the mighty pillars are vaporized, gas and dust will be blown away, exposing newborn stars that were forming inside. A new generation of stars might also spring up from the dusty wreckage. Spitzer is a space telescope that detects infrared, longer-wavelength light that our eyes cannot see. This allows the observatory to both see the dust and see through it, depending on which infrared wavelength is being observed. 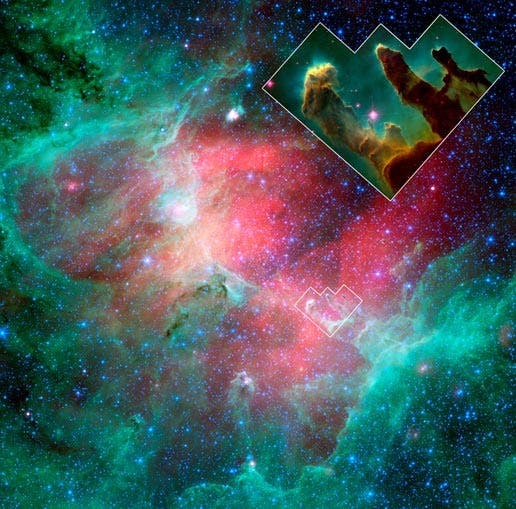 In Spitzer's new look at the Eagle nebula, the three pillars appear small and ghostly transparent. They are colored green in this particular view. In the largest of the three columns, an embedded star is seen forming inside the tip. Above the pillars is the enormous cloud of hot dust, colored red in the picture, which astronomers think was seared by the blast wave of a supernova explosion. Flagey and his team say evidence for this scenario comes from similarities observed between this hot dust and dust around known supernova remnants. The dust also appears to have a shell-like shape, implying that a supernova blast wave is traveling outward and sculpting it. The mysterious dust was first revealed in previous images from the European Space Agency's Infrared Space Observatory, but Spitzer's longer-wavelength infrared instrument was able to tentatively match the dust to a supernova event. "Something else besides starlight is heating this dust," said Dr. Alberto Noriega-Crespo, Flagey's advisor at the Spitzer Science Center. "With Spitzer, we now have the missing long-wavelength infrared data that are giving us an answer." The Daily Galaxy via NASA/Spitzer For additional graphics and more information about Spitzer, visit http://www.spitzer.caltech.edu.